I know what you might be thinking, "what about your kids? Aren't they cold?" 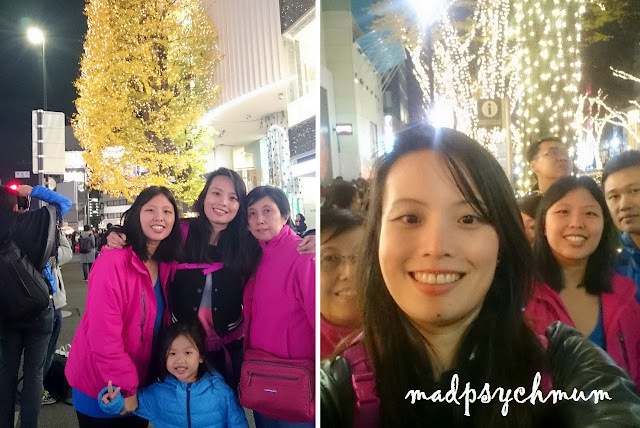 For some reason, although the kids tend to catch a chill pretty easily in Singapore, they were perfectly fine in Tokyo! No coughing, no running nose, nothing! I can only conclude that the air must be fresher in Japan! That morning we also had breakfast at our hotel's restaurant on the 3rd floor. 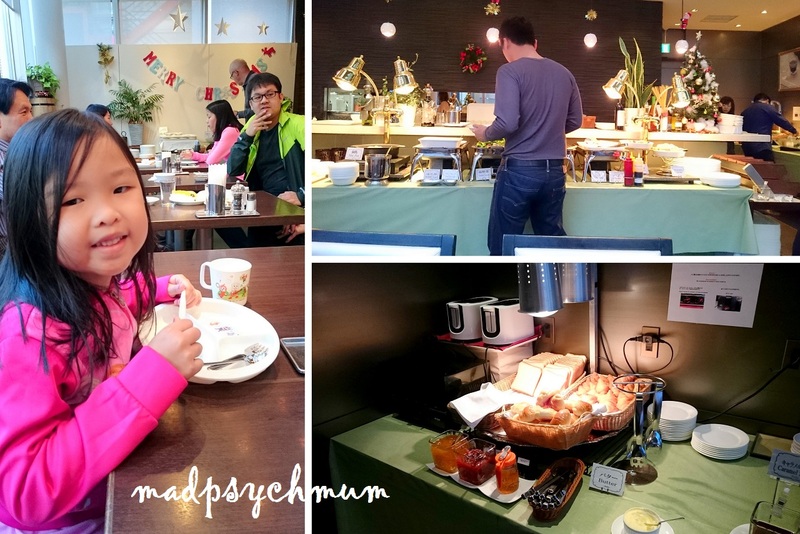 It was a simple spread of the usual western-style bread, eggs and sausages as well as traditional Japanese favourites such as Miso soup, Japanese hot pot, curry rice, etc. In case you're wondering what my baby ate, Baby Boy ate a bowl of porridge, a bit of bread, some scrambled eggs and basically whatever that is soft and tasty every morning. He's not very fussy and has an amazingly big appetite! 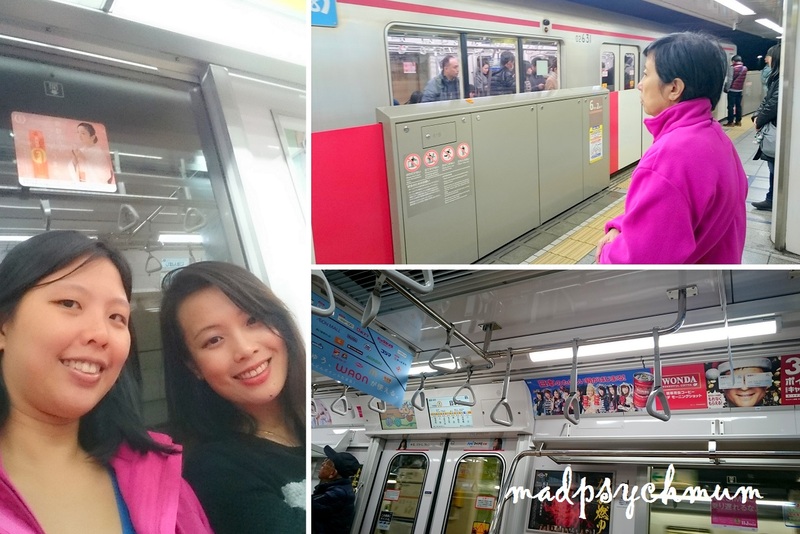 After breakfast we headed out to Shinjuku Station to take a subway to our first destination. There are many of such entrances that will lead you to the subway stations. However, they are mostly made up of stairs so if you have a stroller, look for a departmental store with subway access. Then you can take a lift down to the basement rather than carry your stroller down the stairs. We arrived at the Tokyo Metro office and bought the Tokyo Metro 1-Day Open Ticket for unlimited train rides in one day. It's cheaper and we don't have to keep buying a ticket every time we needed to take the train. Do note that the pass we bought is only applicable for rides on the Tokyo Metro and not Toei Subway (indicated by a green fan logo) or the Japan Rail. You can buy the Common 1-Day Ticket that can be used for both the Tokyo Metro and the Toei Subway but that's more expensive. Since there are 9 Tokyo Metro lines (and you will therefore be easily connected to most of the attractions in Tokyo), the one we bought will suffice. Make sure you arm yourself with the Tokyo Subway Map and check that the lines that you are taking fall under the Tokyo Metro lines. To get to our destination, Asakusa, we took the Marunouchi Line (Red) from Shinjuku Station to Akasaka-Mitsuke Station before transferring to the Ginza Line (Orange) to Asakusa Station. 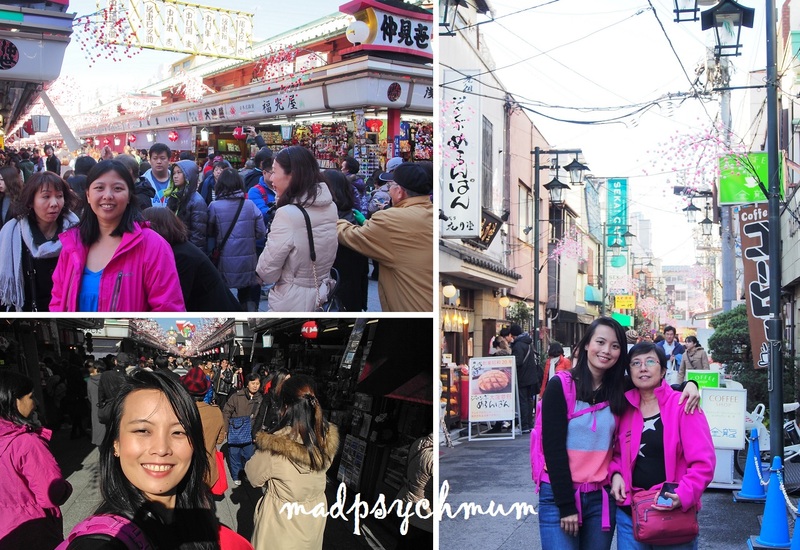 After emerging from the station, we really had no idea as to which direction that we had to walk in order to arrive at the famous Asakusa Nakamise Shopping Street. As I was just about to check Google Maps, I spotted a group of tourists crossing the road with their tour guide waving a red flag. "Follow them!" I exclaimed, "they confirm guarantee plus chop going where we want to go!" Lots and and lots of people! Most of the stalls here require you to consume their food within their stall premise so as not to dirty the street or inconvenience other stalls. 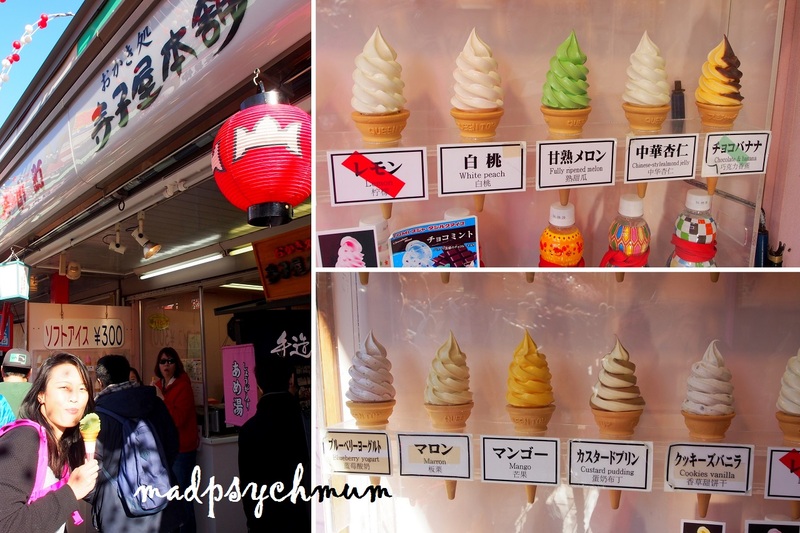 This includes street food such as mochi, pastries and even ice-cream. (There are so many people queuing up that I couldn't take a decent picture. I'm holding the green tea flavour but we highly recommend the black seseme! Stall selling pastries at the end of the street. Lots of people crowding around to buy it. 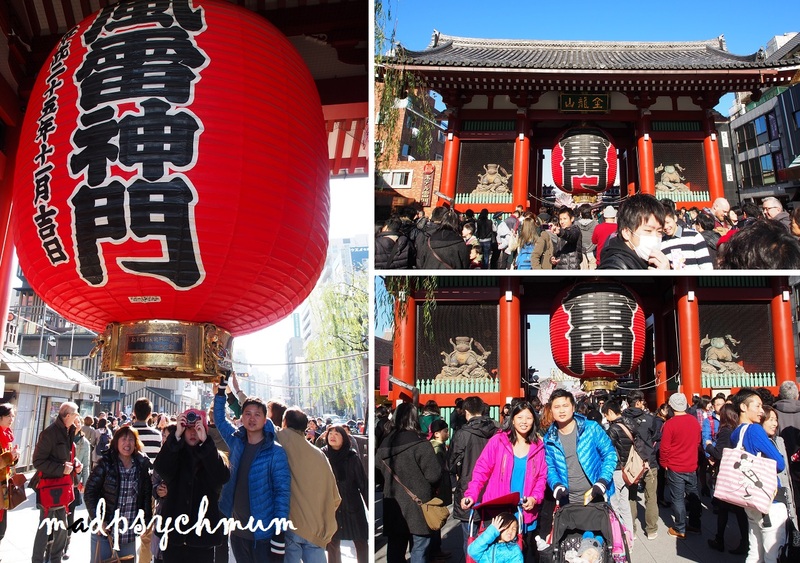 At the end of the shopping street, you'd find the Asakusa Kannon Temple also known as Sensoji. 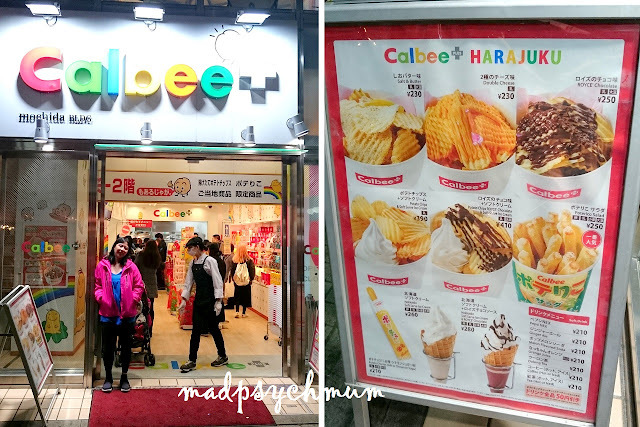 On our way back, we stumbled onto this Taiyaki store that had a super long queue. As the typical Singaporeans that we are, we joined the queue (but of course!). Besides, Taiyaki was one of my girl's favourite food. Chef making the super thick Taiyaki! Bigger than those we see in Singapore! Baby Boy was actually sleeping when we were buying the Taiyaki and for some reason, he woke up while we were eating it. When he saw that we were enjoying the food without him, he looked angry and demanded that we feed him. Of course he ended up loving it and ate about half a Taiyaki! 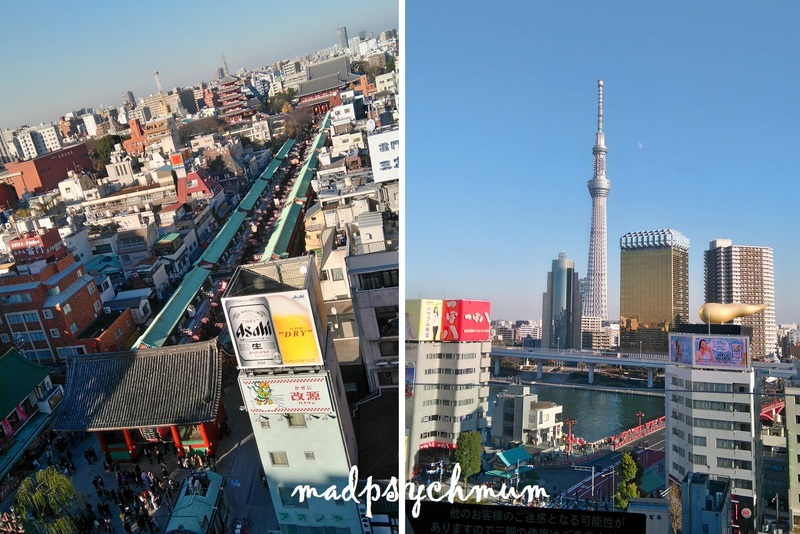 We crossed the road from the shopping street to the Asakusa Visitor Centre so that we can use the toilets as well as enjoy the view from the roof (free of charge). Left: Get tourist information on both the first and the second floor. Restrooms at the basement. 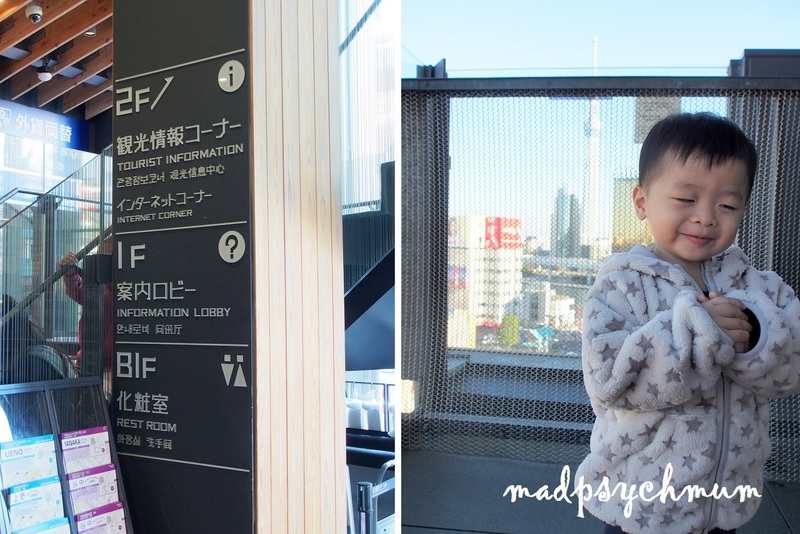 Right: Baby Boy feeling a bit cold at the roof of the building. We sat on the nice benches provided and rested our feet while taking the beautiful skyline of Asakusa. 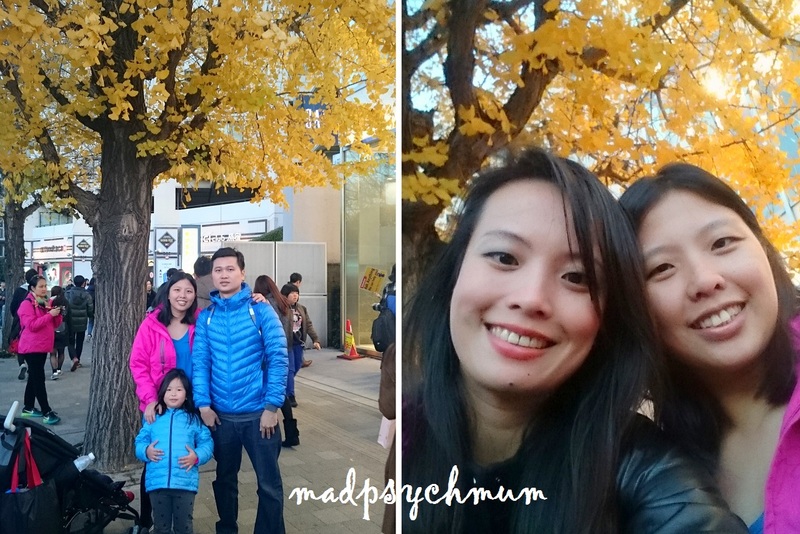 After we felt that we had rested enough, we decided to head to Harajuku. To get there from Asakusa, take the Ginza Line (orange) to Shibuya Station and transfer to the Fukutoshin Line (brown) to Meiji-jingumae (aka Harajuku) Station. 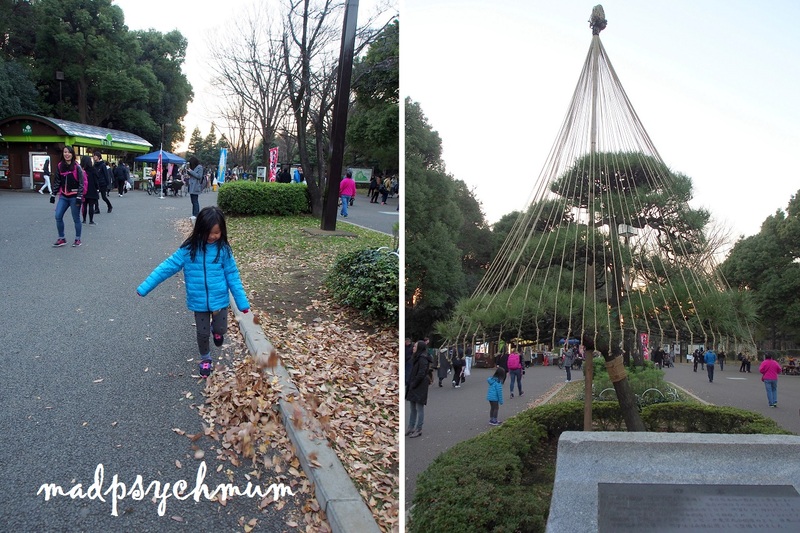 Girl kicking fallen leaves under a "Christmas tree"
We decided to leave before it got dark and started walking to the biggest Daiso in Tokyo (at least according to Google). 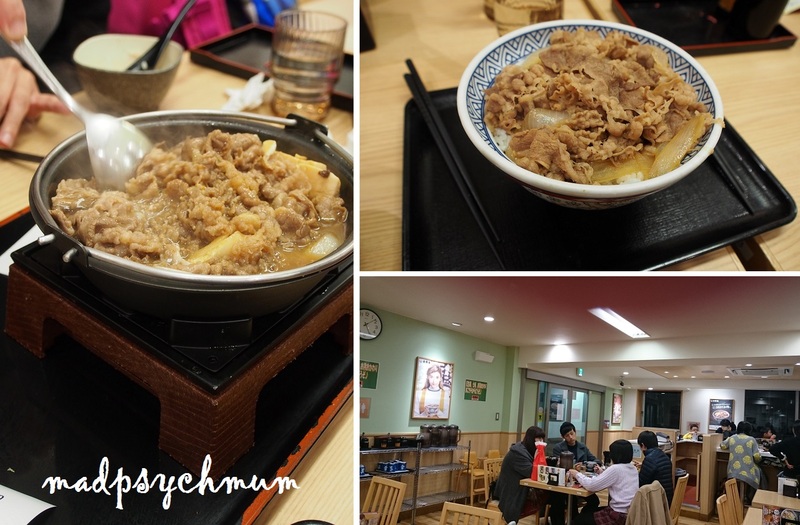 When we reached the entrance of Takeshita Street, we spotted Yoshinoya! Yoshinoya in Japan is an actual restaurant, not just a fast food outlet, and is a lot tastier than the Yoshinoya in Singapore so it was at the top of our "To Eat in Tokyo" list. Eating what they are famous for: Beef Rice! After dinner, we finally made it to Diaso (Harajuku) located just 5 minutes from the entrance of the Takeshita Street (walk through the entrance and down the street until you see Daiso). It's a 4-storey building so it should be hard for you to miss it. Eating freshly fried-on-premise Jagabee. Soooo goood! And with our stomachs full of food, our bags full of shopping and our hearts full of happiness, we left funky Harajuku and returned to Shinjuku.